Artist’s impression of the completed Cannons Creek bridge. Transmission Gully’s Cannons Creek bridge is one of the project’s most significant structures. In coming months this huge structure will reach a major milestone when the spans are “launched” across Cannons Creek gorge to eventually sit on the bridge piers that are currently being completed. 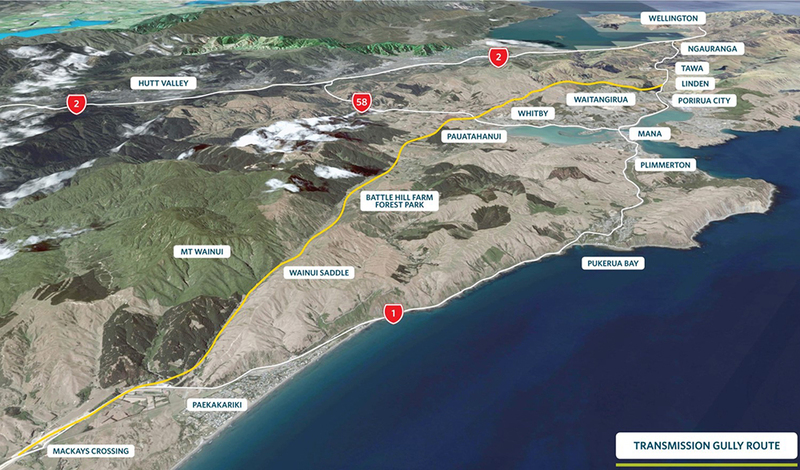 The new inland Transmission Gully route. The design and construction of Transmission Gully to withstand a significant natural disaster is a key objective for the NZ Transport Agency. NZ Transport Agency Senior Manager Project Delivery Chris Hunt says it is critical that the new motorway is resilient and can provide a lifeline route to and from Wellington in the event of a significant storm or earthquake. Have a look at the visual representation of what has been achieved to date and the upcoming milestones. Aerial view of the flyover and one of the interchange roundabouts taking shape at Lanes Flat. SH58 is visible in the foreground. Here’s what’s been happening across the Transmission Gully project, and what’s coming up. 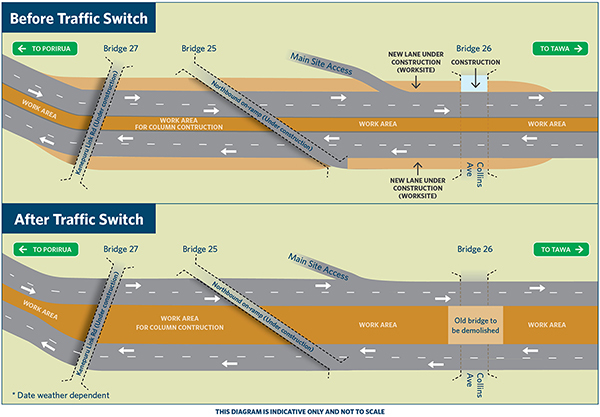 The traffic switch between the Mungavin Interchange and Linden marks the next stage in a series of changes for road users in this area as a result of progress on Transmission Gully. 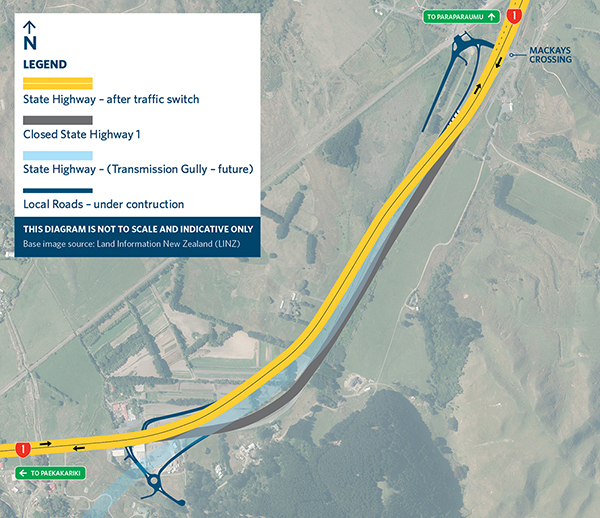 In the north, we are still working on preparatory works for temporarily switching State Highway 1 over to join part of the new stretch of local road to Paekākāriki and the coast. We are building a section of new road that will run alongside the new motorway to provide a long-term route to Paekākāriki and the Centennial Highway. At State Highway 58 in Pauatahanui, we need to switch traffic onto a new permanent layout, between the roundabout at Lanes Flat and Bradey Road. 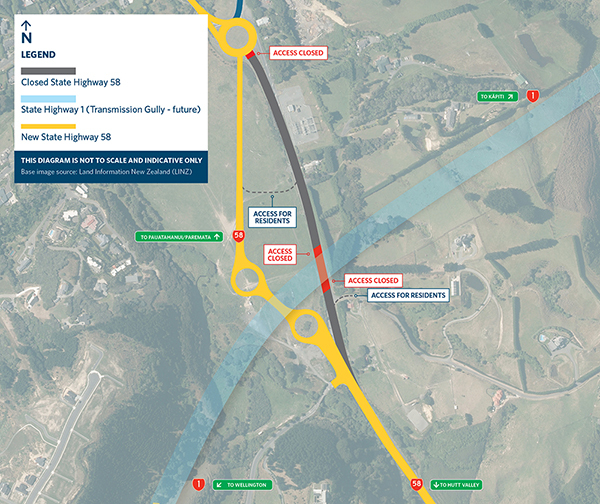 This is planned to occur near the end of the year and will see traffic running under the new overbridge constructed to carry the Transmission Gully motorway across SH58. Left to right: Mark McKenzie, Justin Redelinghuys, Sergio Mejia. We welcome the new CPB HEB JV Construction Director Justin Redelinghuys to the Transmission Gully project. Left to right: Papua Taumate, Gabby Bush and Jemma Dutton. Transmission Gully team members won two of the seven categories at the annual Hays National Association of Women in Construction NZ (NAWIC) Excellence Awards held in Auckland last month. Transmission Gully visitor centre in Mana. Have you stopped in at the Transmission Gully Project mobile visitor centre located at Dolly Varden Beach in Mana yet? If not, you better be quick, as the mobile centre will be picked up at the end of the month and transported to Civic Square, beside Wellington Library. It will be there for the next few months, to give central city workers and residents a chance to view information about the Transmission Gully motorway project, together with details of the Waitangirua and Whitby Link Roads, which are being built for the Porirua City Council at the same time as the new motorway. The mobile Transmission Gully visitor centre is open to the public Monday to Saturday from 10am until 4pm. Don’t forget to tell your friends and family to sign up to receive the latest project news. We hope you enjoy reading these updates, and we’d love to hear from you. If you have any questions, comments or story suggestions, you can email them to info@tg.co.nz. You have received this email because of previous communications with the NZ Transport Agency. If you no longer wish to receive these emails you can choose to unsubscribe here. If you received this email from a friend, sign up to receive this newsletter.